At some point, advertisers and marketers alike decided that ice cream needed to be more exciting and enticing than it already is, and set out to come up with trademarked names for ice cream vendors’ concoctions. Take Dairy Queen. 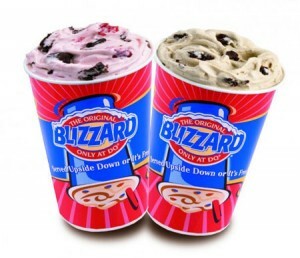 Their signature ice cream mixture is the Blizzard. It makes sense – it’s something frozen and it’s all a “whirl” of tasty deliciousness. The local place near me, Custard Cup, calls theirs a Snowstorm. As a woman whose hometown is St. Louis (that’s in the state of Missouri; I have actually been asked that before), I would be remiss if I didn’t bring up Ted Drewes. What’s Ted Drewes, you ask? Only the best frozen custard in all the land. Surprisingly, this is not a frozen treat everyone is familiar with. And it is NOT frozen yogurt or Pinkberry or anything like that. Frozen custard is a cold dessert similar to ice cream, made with eggs in addition to cream and sugar. In the United States the Food and Drug Administration requires products marketed as frozen custard to contain at least 10 percent milk fat and 1.4 percent egg yolk solids. If it has fewer egg yolk solids, it is considered ice cream. If you have any kind of discerning palate, you will taste the difference, though I fear you won’t fare very well if you prefer diet or light ice cream. I prefer the purity of Häagen-Daz if I’m going to go for ice cream. Coffee, Chocolate Peanut Butter, and Chocolate are my favorite flavors and they all have about five ingredients, none of them resembling monoglycerinsulfatecresthydrogenelixircarbonate. See that? She’s holding it upside down to show you that it really is frozen and it’s not going to slide out of the cup just because it’s been mixed together. It’s not a milkshake. Nostalgia does strange things to people because now I want to go back and have someone turn upside down my ice cream treat (concrete). Oh and Kevin always makes fun of me for calling anything that is ice cream + candy a concrete. We’re dorks like that. 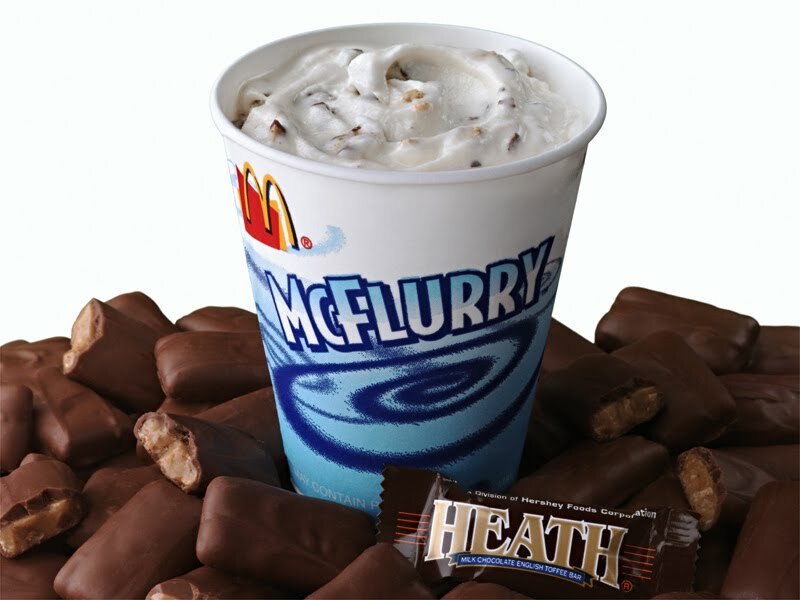 McDonald’s dubbed theirs a Flurry. Just a slight chance of some kind of snow-related weather activity – in a cup. 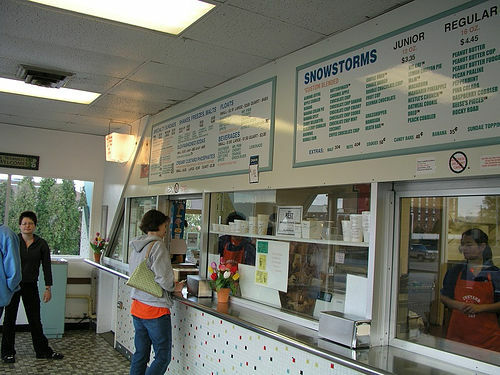 Another local place here called Junior’s Burgers & Custard called their ice cream + candy thingy a Tornado. No need to post a photo. I wonder if a cyclonic image makes people shiver and think, “I want ice cream!” And you know somewhere out there, someplace calls theirs a Cyclone. Sonic calls theirs a Blast. A blast of what? 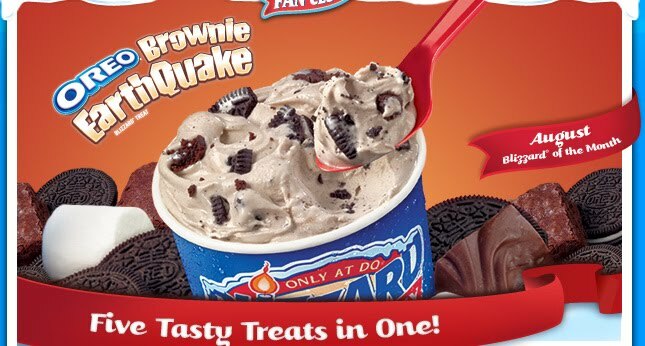 Lastly, as we circle back around to Dairy Queen once more, they also came up with something called an Oreo Brownie Earthquake Sundae. At this point, I have to wonder if the name really does help sell the thing. If it’s not something akin to snow, it’s ice cream as it relates to a natural disaster. Missing are Typhoon, Wildfire, Hailstorm, Volcanic Eruption, Mudslide, Sinkhole, Tsunami, Hurricane, and Flooding. I can see it now: “Can I have a sinkhole with marshmallow, walnuts, cranberries, and Andes mints in it?” I just grossed myself out typing all of that. 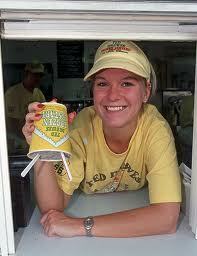 Oh how I wish I would have had the stomach for Ted Drewes when we were in STL. I also wish I had known that the whatever-it-was-I-ordered at Custard Cup was carbonated and would taste like a cough medicine Slurpee. I should have taken your advice and gotten their signature Snowstorm…especially with it being hot and all. There’s a place near me here in New Jersey that calls their a Typhoon, so there’s one less missing! And I am LOVING the Dwight ice cream. Thanks!! I was hoping some people would be able to appreciate that. I would love to hit Custard Cup right now.